At Oaklands, we run our own Radio Station. 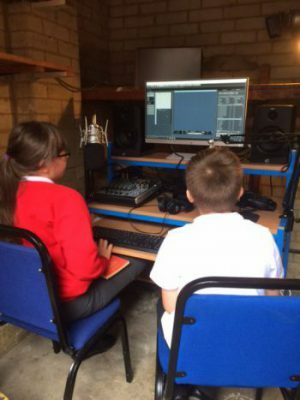 The children write and produce their own range of formats for the radio show which plays throughout lunchtime and can be listened to on-line via Soundcloud or by clicking the links at the bottom of this page. We now have lighting and electricity in our recording studio – nicknamed ‘The Bunker’. In the weeks leading up to Christmas, Key Stage 2 will get the chance to come in and learn the technical ropes as recording their own version of Radio 4’s The Listening Project. After Christmas, Key Stage 1 will get the opportunity to become writers, presenters and producers too. Exciting times! Weekly conversations that build a unique picture of our school and the people in it. What’s New – carbon emissions, state visits and friendship discos. A blend of interview and fantasy with a local business man. From Christmas around the world to the traditions inside our own homes. What if a crocodile writes a terrible recipe? What if a poem tells of two children even hungrier than a crocodile? Book at home-time in 5 short parts – The Giant Cupcake: created by Asma (Year 5) Alexis (Year 2) and Dylan (Year 1); written by Asma and performed by the team. Weekly poetry programme showcasing a wide range of poetry and spoken word. Harvey Slumfenberger’s Christmas Present – you can find this book in our library! Episode 2 – What’s going on?